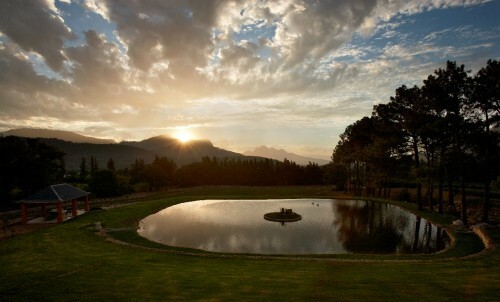 The majestic mountains that surround the idyllic Franschhoek Valley, provideenchanting views in every direction. 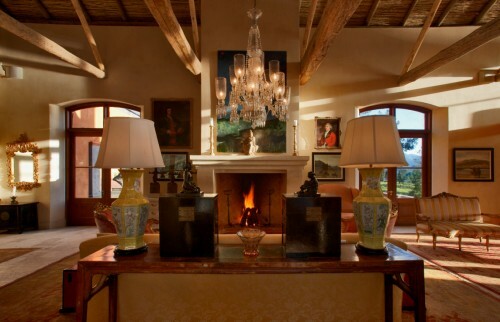 La Residence lies at the heart of a private30-acre working farm, complete with vineyards, plum orchards, a dam and fragrant manicured gardens. 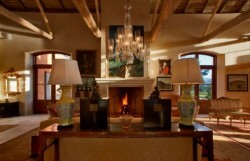 Space is the byword here: soaring mountain views from every suite and vast bathrooms that open onto generous sunny. balconies which offer magnificent opportunities to relax, admire the view, enjoy the delicate scents of nature and marvel at the synthesis of beauty and tranquillity.At La Residence, world-class service is the order of the day. The dining hall and living room resembles a manor hall in chequered marble flooring with walk-in fireplaces and a four-metre chandelier, leading onto terraces with roses and a fountain for alfresco summer evenings. 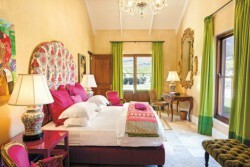 Eleven individually-decorated suites enjoy vibrant colour schemes andspectacular views. 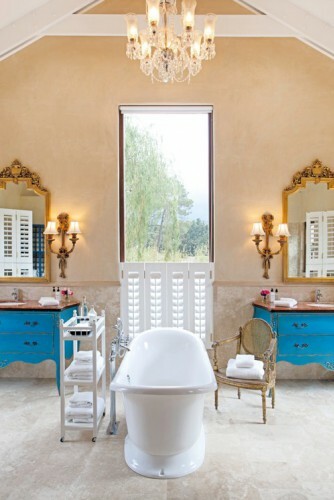 Palatial en-suite bathrooms ooze glamour. 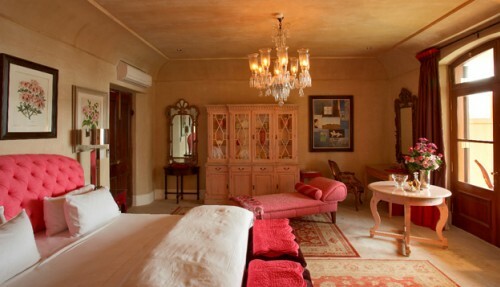 One of the downstairs rooms has a built-in marble four-poster pillared platform bed (heated in winter); there’s an exotic Tibetan suite with Oriental antiques and hand painted screens; French themed boudoirs with imported antiques and mirrored dressers for glitz. Fabrics are top-of-the-range, gorgeous and themed for each interior. 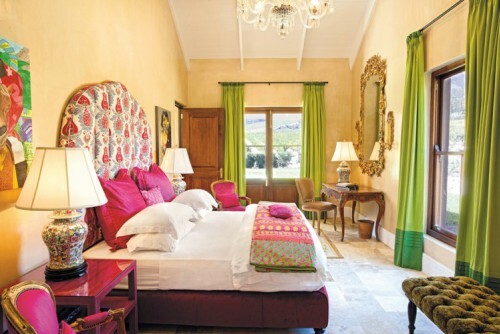 A stone’s throw from La Residence, in a tranquil vineyard setting, five Villas offer spacious accommodation in a variety of configurations for up to 20 guests, including children of all ages. 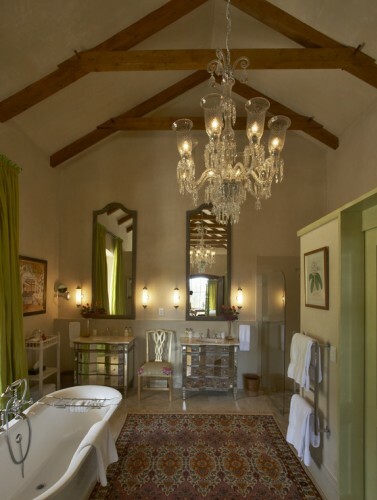 There are stylish rooms for dining and relaxing and luxurious bedrooms with marble en-suite bathrooms. All have private terraces and gardens; four have their own pools. Complimentary drinks and snacks, wide screen televisions and DVD players create a homely feel. 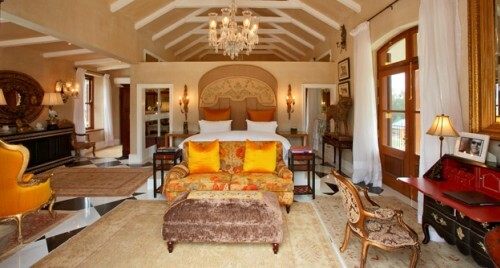 Guests dine either in their villa or the central Terrace Room, beside a fire or the stunning double rim-flow pool. An open kitchen allows full interaction with the chef; the Sitting Room is cosy with bar and wide-screen television. The Villas offer complete flexibility, comfort and superior service to makeholidaying with family and friends effortless and enjoyable. 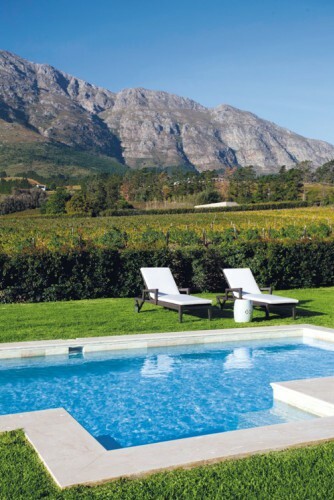 Activities at La Residence include swimming, mountain/village walks, private wine tasting at various estates, cheese tasting and trout fishing. 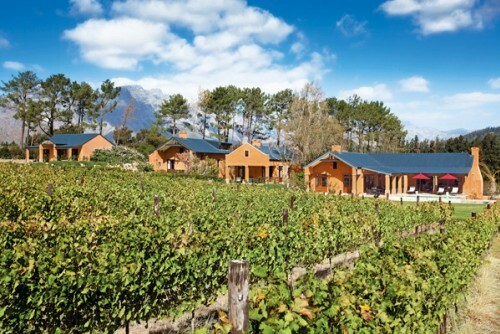 For a wine tour with a difference, hop on to a horse and visit a few of the Vignerons de Franschhoek. Those in favour of a more sedate excursion might enjoy a carriage ride through the village and to some of the wine farms. The courtyard, with a capacity of up to 60 people and breath-taking mountain views, is the perfect venue for weddings and other functions. 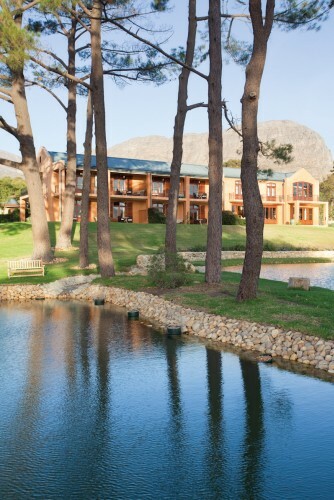 Please note that we do not accept children under 12 years of age, unless the entire hotel is booked exclusively. * 8 to 4 weeks before arrival – 25% of total accommodation fee. * 4 to 2 weeks before arrival – 50% of total accommodation fee. * 2 weeks before arrival – 100% of total accommodation fee.There is also a 25% non-refundable deposit associated to all bookings made between December 15 and January 15. Be transported by this oasis of oriental tranquillity. Giant antique Tibetan hangings above the king-size bed (that can be separated into twin beds if required) add a touch of grandeur. 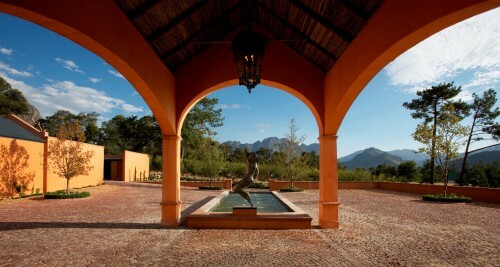 Sweeping views of the vineyards and mountains can be appreciated from the private balcony. Two Bedrooms, Central Living and Dining Area, Covered Patio, Private Garden & OwnSwimming Pool. One Bedroom & One Children`s Loft room,Covered Patio & Private Garden. Two Bedrooms, Central Living & Dining Area,Covered Patio, Private Garden & Own Swimming Pool. Two Bedrooms plus One Children`s Bedroom, Central Living & Dining Area, Covered Patio, Private Garden & Own Swimming Pool. Here the discerning sojourner’s every whim is expertly catered for. Superb cuisine, exceptional hospitality and unrestrained luxury elevate this exclusive getaway to a standard way beyond excellence. After a sundowner overlooking the ocean, the freshest seafood and most delicious international cuisine can be enjoyed. From morning coffee and cake to hot chocolate beside the fire, there is always something delectable on offer.After a lavish breakfast buffet where all manner of cereals, fruits, cheeses and meats are on offer (not to mention the scrumptious hot breakfast menu) lunch at La Residence restaurant is fun, fresh and flexible. 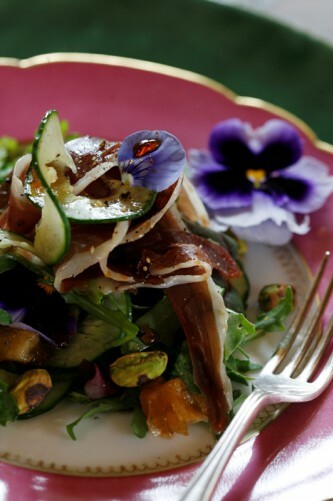 The emphasis is on light and tasty seasonal fare. 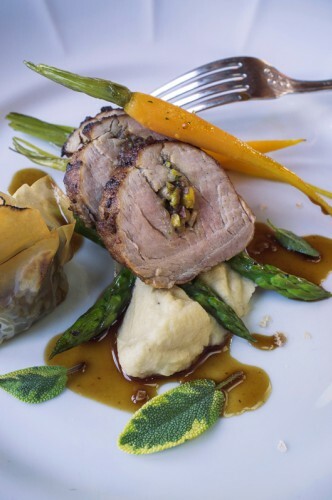 Our passion for regional produce is always in evidence: we enjoy preparing traditional game such as springbok, local fish and free range poultry. 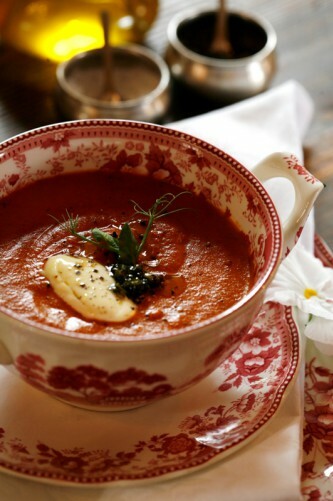 Dining at La Residence restaurant is always a leisurely experience. Begin with an apéritif in the loggia to experience sunset over the dam or sit beside the fire for cocktails and canapés by candlelight.La Residence restaurant’s dining area is reminiscent of a manor hall, resplendent with dazzling chandeliers, black and white flooring and vast fireplaces, while outside, the Persian Alley offers a delightful setting for alfresco summer meals. 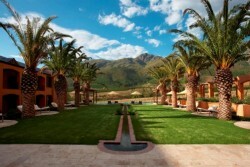 Here a bubbling rill flows between lush green lawn and luxuriant floral borders. 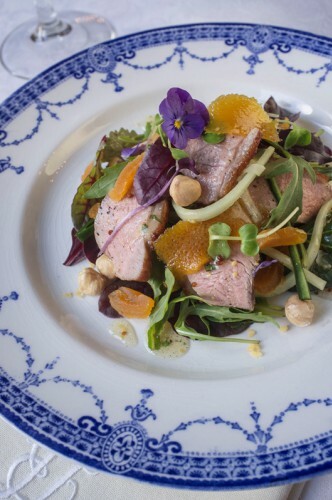 The chef presents a seasonal menu that is alive with flavour, made from the best local ingredients and produce freshly picked from La Residence’s own kitchen garden. For something a little different, indulge in your own personalised cookery demonstration at our Chef’s Table. At the beautiful marble table in our La Residence restaurant dining hall, our chef will prepare your dinner, course by course, with full opportunity for interaction. Ask questions, taste as you go and learn some culinary secrets! This is a lovely experience for anyone with an interest in cooking or curious to understand how our chefs work their magic. 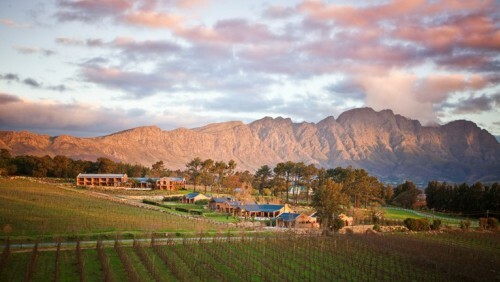 The Franschhoek area is rich in producers of the finest artisanal products. Hand-crafted cheeses such smooth, straw-coloured Angelot and delicious, cumin-spiced Boerenkaas are served with home-made preserves and breads. 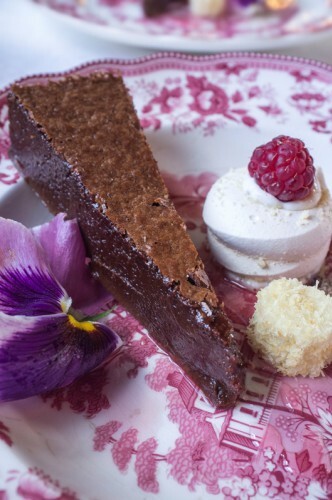 Local berries and fragrant fynbos honey are familiar faces on the dessert menu. 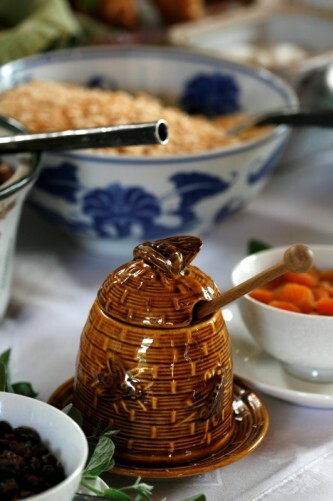 Guests are encouraged to put forward their food preferences, allergies and dietary requirements so that meals can be tailored to suit to their personal tastes and needs. All menus in La Residence’s restaurant are complemented by excellent South African wines. We at La Residence endeavor to produce dishes with fine flavours, diverse textures, the freshest local ingredients and attractive presentation.Salads include, besides regular leaves, tomatoes and such, refreshing funnel bulb, pickled lemon, caper berries, sumak, sesame, walnut, avocado, pumpkin seed and other oils.Soups are a speciality and they range from wintery Egyptain lentil soup to light parsnip soup and Flavorsome chilled spicy tomato and yoghurt soup. Lennard Marais grew up in a farming community in the Swartland region of the Western Cape. With no grocery stores nearby, everything was made fresh at home and Len quickly developed a passion for cooking as he helped his mother with her daily food preparations. He knew from an early age that food would always be a big part of his life and it seemed natural for him to pursue cooking as a career. Len joined John Jackson at his acclaimed ‘Jacksons’ restaurant early on in his career where he did in-service training receiving mentorship from one of the best chefs in the country. He then moved on to Klippe Rivier Homestead, one of the first 5 star guest houses in the country where he was resident chef. After this, he moved on to be a part of the opening team at the Table Bay Hotel at the V&A Waterfront where he was exposed to new cooking styles and some of the best chefs in the world. Len’s warm and hearty personality drew him back to boutique hotels where he could spend more time interacting with guests and he spent some years at the very exclusive Ellerman House Hotel in Bantry Bay. He then took time off from hospitality to travel the world and learn new International cuisines. In between trips, he used the knowledge and experience that he had acquired to give cooking classes and also did private catering specialising in wedding cakes. baking, pickling and preserving techniques that he learnt in his childhood are put to good use as he incorporates produce fresh from our farm into all aspects of his menus. Transfers are excluded from the daily rate but can be arranged at an additional cost.